BEILZE CITY, Mon. 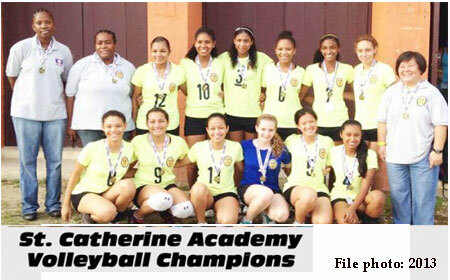 Sept. 28, 2015–The Central Secondary Schools Sports Association (CSSSA) 2015-2016 Volleyball Tournament gets under way today, Monday, September 28, at Bird’s Isle, beginning at 4:30 p.m. Six (6) female and nine (9) male high school teams from Belize City will battle for 5 weeks to represent the CSSSA at the national tournament, which is scheduled to start on Friday, November 6. FEMALES (F) – ACC (Anglican Cathedral College); BHS (Belize High School); LTH (Ladyville Technical High School); NHS (Nazarene High School); SCA (St. Catherine Academy); and WES (Wesley College). MALES (M) – ACC; BHS; GLH (Gwen Lizarraga High School); LTH; MWH (Maude Williams High School); NHS; SJC; SVT (Sadie Vernon Technical High School); and WES. According to the released tournament schedule, both females and males will play a single round-robin, after which the top 4 teams from each category go on to best-of-3 games semifinal series. The winners then meet in the Finals best-of-3 games series. Opening games begin at 4:30 p.m. on week days, and at 10:00 a.m. on Saturdays. Mon. Sept. 28 – (F) SCA vs ACC; (M) NHS vs LTH; (M) SJC vs BHS. Tue. Sept. 29 – (F) BHS vs LTH; (M) MWH vs GLH; (M) WES vs ACC. Wed. Sept. 30 – (F) NHS vs WES; (M) BHS vs NHS; (M) SVT vs SJC. Thurs. Oct. 1 – (F) LTH vs ACC; (M) LTH vs WES; (M) ACC vs MWH. Fri. Oct. 2 – (F) SCA vs BHS; (M) GLH vs SVT; (M) NHS vs WES. Sat. Oct. 3 – (M) MWH vs SVT; (M) ACC vs GLH; (M) SJC vs LTH; (M) BHS vs SVT.